The FDCS196 is Linkam’s highly reliable and reproducible freeze dry microscope stage used by leading research scientists within the pharmaceutical and food science industries. Need assistance with your order? We can help. The FDCS196 is Linkam’s highly reliable and reproducible freeze dry microscope stage stage used by leading research scientists within the pharmaceutical and food science industries. Using the FDCS and light microscopy techniques such as phase contrast and polarized light, it is now possible to accurately determine collapse and eutectic temperature and intricately investigate freeze dried structure of complex samples. Both stage pressure and temperature can be accurately controlled and programmed to simulate industrial procedures and determine ideal drying parameters. Temperature is measured to 0.01°C by a Pt100 resistor mounted close to the sample and controlled to 0.1°C even down to pressures as low as 10-3mbar. 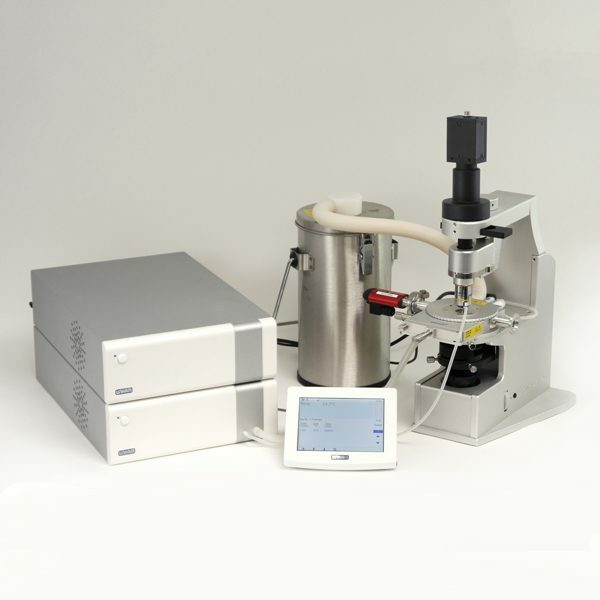 Chamber pressure is monitored by a pirani gauge mounted directly on the stage and shows the stage to hold perfectly uniform vacuum even when the XY manipulators are used to follow the drying front moving across the sample. The pressure can now be controlled by the new Linkam VC94 motorized valve. Simply type a chamber pressure and observe the new stable vacuum in less than a minute. A graph of temperature against time also shows the plot of the chamber pressure throughout the experiment. Using the LINK software it is possible to capture images of the freeze drying run with all the experimental data (temperature, time, date, pressure, magnification) inlaid in each image. These images can be viewed in a gallery or as an AVI movie with captions containing all the data scrolled underneath the viewing window. With a temperature range down to -196C, Ultra low temperature eutectics can be investigated with the FDCS system, not possible with peltier controlled systems. McCrone Group's analytical scientists are available to answer your questions. Have a project you'd like to discuss? Give us a call or email us!